There are many different recipes and hundreds of different uses for chocolate buttercream frosting. At its best, chocolate buttercream is gooey, chocolatey, rich and decadent. At its worst, it is greasy, overly sweet and imparts a grainy, gritty texture in the mouth. Recipes for this delightful confection range from simple to complex. The more simple the recipe, the less stable your frosting will be. 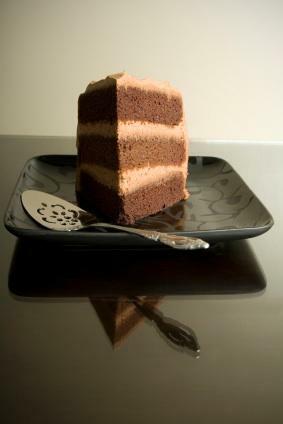 More complex versions are used by professional pastry chefs when they need a frosted cake to last several hours at room temperature. This style of buttercream is the most well known in classic American cookery. It is perfect for cakes that don't need to sit out at room temperature for many hours, such as birthday cakes or novelty cakes. The best part is that this type of buttercream doesn't require a lot of special skill or equipment. All you need is a wooden spoon and a bowl. Combine powdered sugar and cocoa in a small bowl. Whisk until uniform. In a large bowl, cream the butter with a wooden spoon until very soft. Sift in 1/2 cup of the cocoa/sugar mixture and beat with the wooden spoon until the mixture is well combined. Add the rest of the cocoa/sugar mixture, 5 tablespoons of milk and the vanilla, and beat with the wooden spoon until the frosting is creamy and fluffy. If it is still a little stiff, add more milk, one teaspoon at a time until the frosting is at ideal spreading consistency. Classic chocolate Swiss buttercream is a more involved process. It is made by whisking butter into egg whites that have been tempered with a sugar syrup. The resulting frosting is extremely stable and can withstand room temperature for up to five days without breaking or oozing melted butter. Chop chocolate into fine shards. Place the chocolate into a metal bowl and set over a saucepan of barely simmering water until melted. Making sure that no water gets into the chocolate. Stir until smooth and let cool. In a medium heavy saucepan bring the water and sugar to a boil, stirring until sugar is dissolved. Boil this mixture without stirring until a candy thermometer registers at 248 degrees F.
In the bowl of an electric mixer, beat egg whites with a pinch of salt until foamy and then beat in cream of tartar. Beat the whites until stiff peaks form and then slowly drizzle in hot syrup in a steady stream. Beat mixture at medium speed until completely cool, about 7-10 minutes. Beat in room temperature butter, one piece at a time until mixture is thick and smooth. Beat in cocoa, melted chocolate and another pinch of salt until smooth. Decorate simple yellow cupcakes with a swirl of chocolate frosting. Slather slices of rich pound cake with the buttercream for a decadent afternoon tea party snack. Sandwich a layer of buttercream between a couple of ginger snaps for a wonderful after-school snack.